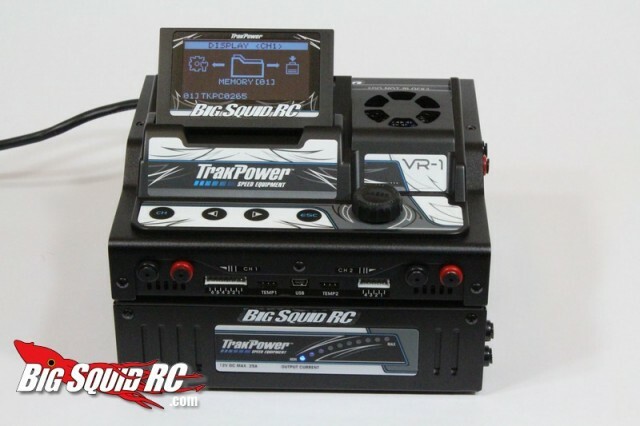 Review – TrakPower VR-1 Dual Channel Balancing Battery Charger « Big Squid RC – RC Car and Truck News, Reviews, Videos, and More! Build Quality: Nicely constructed chassis, membrane push buttons felt good, knob felt like it was directly off the ICE. Set-up Notes: We ran the VR-1 bone stock, we even used the included Deans connector. 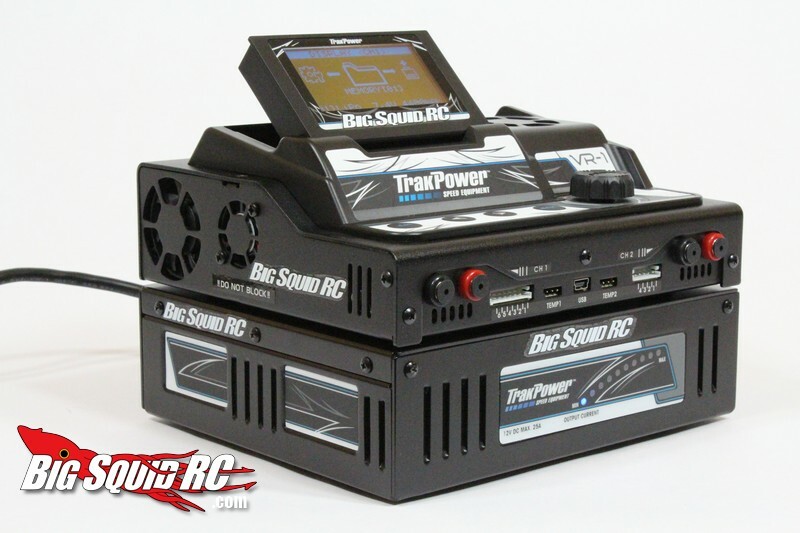 To power the VR-1 we used its mating TrakPower DPS 25 amp power supply. 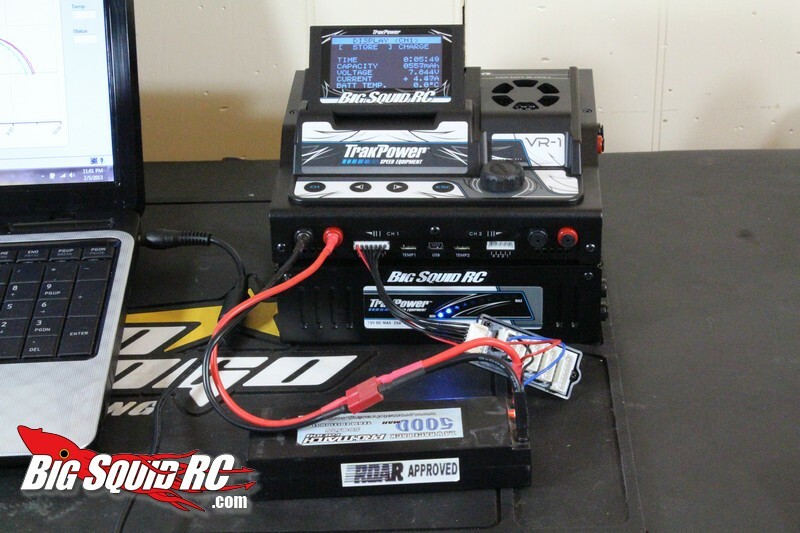 We used Pro-Match 2S 5000 mah Lipo’s for both bench and drive testing. Ease of Use: The VR-1 can come across as a bit overwhelming the first time you turn it on, but the majority of our testers were able to perform proper charges without the consultation of the manual. The TrakPower can do a lot of different functions, and it does take a few minutes to get used to the way the menu is laid out. However, one of our testers (read- Iron Mike) had to refer to the manual, and even then he still had a tough time performing a proper charge on the proper channel. 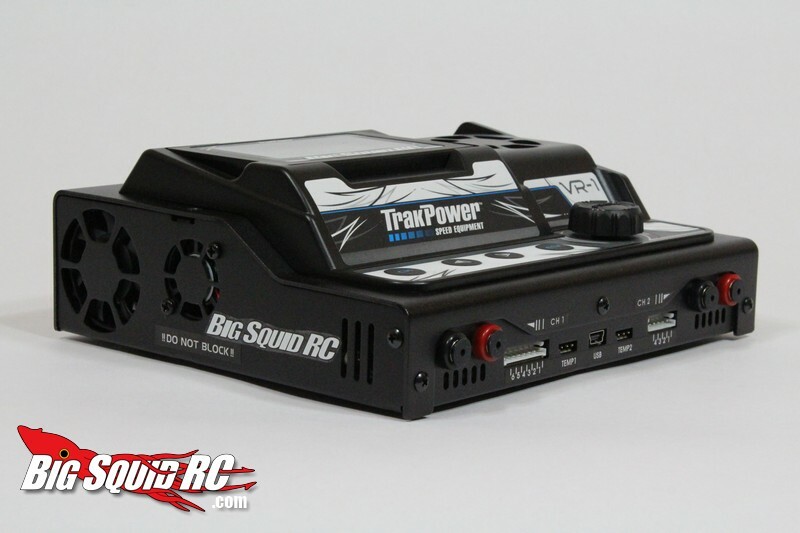 Power: The TrakPower VR-1 has got some serious yank to it. 20 amps on port 1 is some serious juice, and while you are busy charging a 2S 5000 mah Lipo at 4C on port 1 you can charge another pack at up to 6 amps on port 2. On track: Packs charged with the TrakPower felt rock solid on the track. 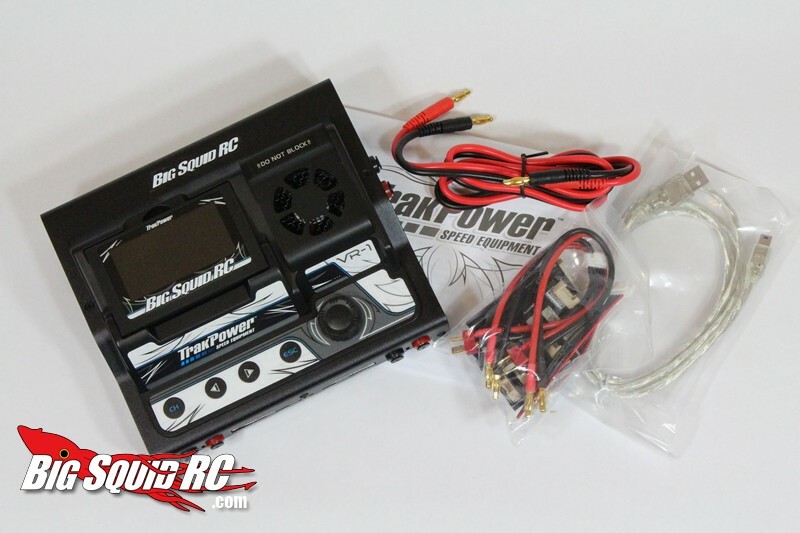 After charging a Lipo on “some chargers” you can tell they feel a bit soft when you drive with them, but not so with the TrakPower. 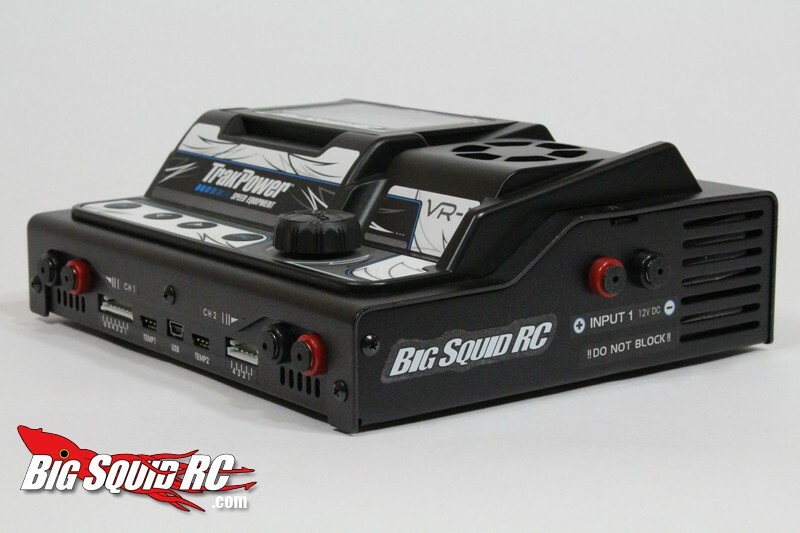 Our Lipo’s that came off the TrakPower always felt strong with tons of punch. Broken Parts/Issues: The VR-1 worked exactly as it should and we didn’t experience any issues. No overheating, no loose connections, it worked reliably for us. We ran the TrakPower at full tilt for a half dozen charges with no issues, and it lived through our normal “knock it off the pit table to concrete” tests just fine. What benefits can you see from a better quality charge? Two things- longer run-times and higher voltage. Years ago it was a big deal to buy a charger that was said to give a better charge than another brand. With the advent of Lipo batteries it seems like everyone has forgotten that yes it is still possible for one charger to do a better job of charging than another. We’ve seen it first hand- we’ve seen chargers that simply would not fully charge a Lipo, and we’ve seen chargers that said 8.40 volts on their screen, but when tested by a multi-meter it showed a significantly lower voltage. The only way to find out if a charger is truly giving you a good charge is to test it first hand, and that’s what we did with the TrakPower VR-1. 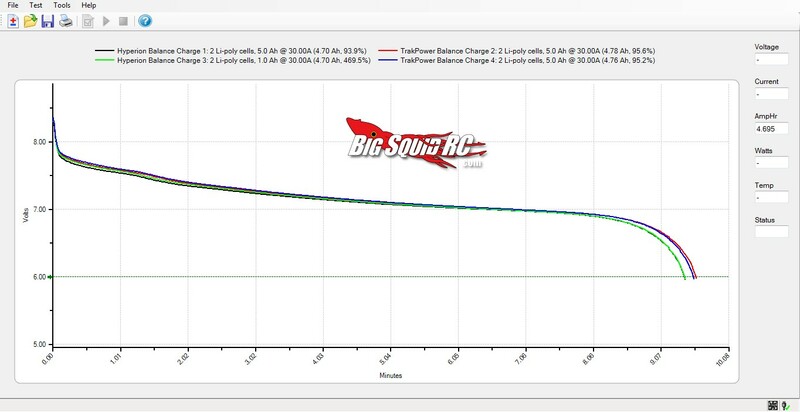 We did four discharges to determine the quality of fast charge, runs 1 and 3 after using our reference Hyperion 720 iNet3, runs 2 and 4 after using the TrakPower VR-1. 1. At the start of the day we fully charged a Pro-Match 2S 5000 mah Lipo battery. The Pro-Match we used for this test that had roughly 80 cycles on it. 2. Immediately after the pack was fully charged, we discharged the pack at 30 amps to 3 volts per cell on our West Mountain CBA. This was a sort of warm up and we did not keep the graph of the discharge on this run. 3. After the pack returned to ambient temp (71 F in this case) I immediately fast charged (not balance charged) the battery on a Hyperion 720iNet3 at a 2C (10 amp) charge rate. 4. Immediately after the pack was fully charged it was then discharged at 30 amps to 3 volts per cell on our West Mountain CBA and we saved the graph. This was the first “run” saved for comparison purposes. 5. 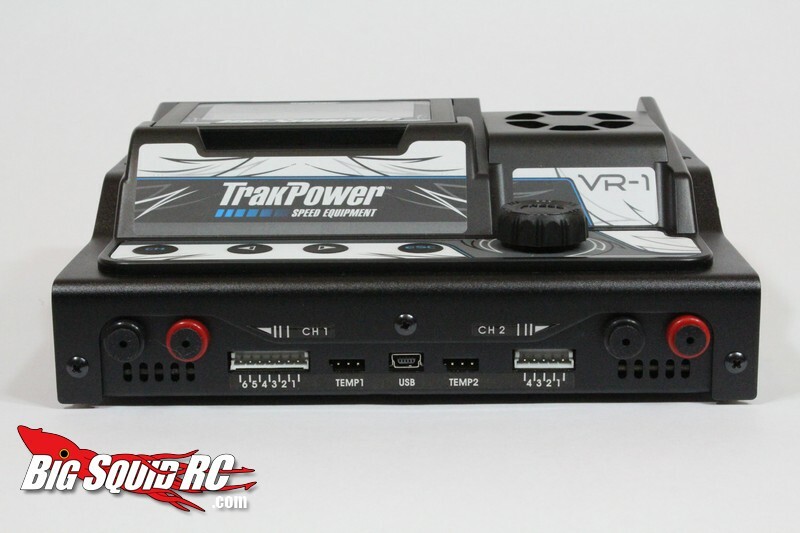 The pack was allowed to cool to room temp, then immediately fast charged (not balance charged) with the TrakPower VR-1 at 2C (10 amps). 6. Immediately after the pack was fully charged it was once again discharged on the West Mountain at 30 amps making for the second “run” for comparison purposes. 7. Once the pack had reached ambient temp it was immediately charged on the Hyperion then discharged for a third “run”. 8. We did one final cycle using the TrakPower for the charge. We used 2C charge rates because that’s what we use in the field. We chose a 30 amp discharge as it represents a 6C (10 minute) discharge, roughly the type of run-time we’d expect to get out in the field. Charging was done in “fast charge” mode without balance charging, just like we would do in the field. All 5 charges and discharges were conducted on the same day in the most consistent manner possible. Run #1 was charged by the Hyperion and resulted in a tested capacity of 4729 mah, with a 9 minute 30 second long discharge. 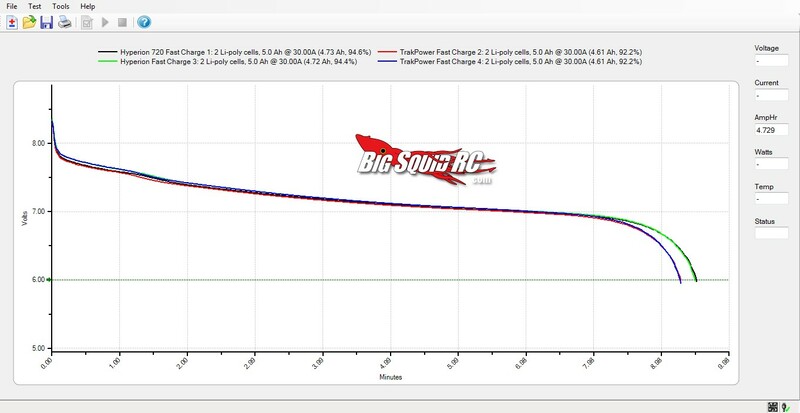 Run #3 charged by the Hyperion resulted in a tested capacity of 4720 mah and a 9 minute 29 second long discharge. To boil it down, nothing in our review can be considered a “scientific” trial by any means, a measly 4 discharges are not nearly enough to declare something as fact. We did these tests just to get a general idea if the quality of 2C fast charge from the TrakPower was in the ballpark or not. Did the TrakPower or the Hyperion give the better quality fast charge? In this case it was the Hyperion, but it was close. After charging on the Hyperion, our test pack yielded slightly longer run-times, and slightly higher voltages then when fast charged on the TrakPower. Runtimes- The Hyperion yielded discharge times of 9:30 on the first pass and 9:29 on its last pass. Both run-times for the TrakPower were 9:16, that’s up to 14 seconds less than the Hyperion. How long did it take the TrakPower to fully charge our Pro-Match 2S 5000 at a 2C rate in fast charge mode compared to our reference Hyperion? In “fast charge” mode we recorded these charge times with the TrakPower- first 2C fast charge (run #2): 32 minutes and 04 seconds, second 2C fast charge (run #4) took: 31 minutes and 46 seconds. When using the Hyperion- first 2C fast charge (run #1): 42 minutes and 30 seconds, second 2C fast charge (run #3) took: 41 minutes and 36 seconds. Based on this paltry amount of testing, the Trakpower saves around 10 minutes of charge time at a slight loss of voltage output and a loss of about 14 seconds run-time. Not a bad trade off if you ask me, especially if your friends are already out in the cul-de-sac driving and you forgot to pre-charge some packs before you showed up. How did the TrakPower stack up when doing a full 2C balance charge against our reference Hyperion? We did another 4 runs on the West Mountain in the same manner as above, but this time we used the highest quality charge each unit could provide. Runtimes- After being balance charged on the TrakPower the Pro-Match pack ran for 9:36 at 4778 mah (run #2) and 9:34 at 4762 mah (run #4) on the 30 amp discharge. The results for the Hyperion were 9:26 runtimes at 4695 mah (run #1 and #3) for both dis-charges. As the numbers show the pack produced longer runtimes when 2C balance charged by the TrakPower VR-1, up to 10 seconds longer. When looking at the discharge curves and at the voltage data above, the test pack produced higher output voltage when charged with the TrakPower VR-1 than when charged on our reference charger. Combine the higher voltage with the longer runtimes and the TrakPower provided an overall superior 2C balance charge than our reference charger. 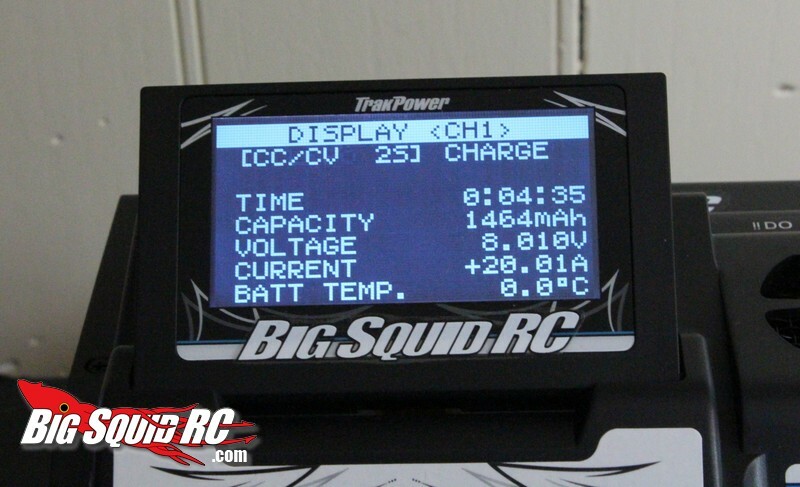 2C Balance Charge Times- Because the amount of time it takes to balance charge a Lipo depends so much on the state of balance of the pack, it’s very hard to compare charge times. The pack we used for testing tends to consistently stay well balanced, so very little balancing had to be performed by the chargers. So while I wouldn’t recommend you really compare these numbers, here they are. 2C Balance charge times- Trakpower 38:59 (run #2) and 41:28 (run #4). 2C Balance charge times- Hyperion 39:46 (run #1) and 39:23 (run #3). The VR-1 & DPS combo was a head turner in the pits. These two were made for each other and both performed like pro’s. The VR-1 uses 3 fans to help keep it cool, thankfully they are relatively quiet. The tones at the end of the charge were quite reasonable to listen to and were not irritating. Loud enough to hear, yet didn’t get on your nerves. We were not a fan of one channel being more powerful than the other. On channel 1 you can charge at up to 20 amps, while on channel 2 at only 6 amps. Most of the packs we take bashing are pretty much the same size. We actually had more power than we probably needed on channel 1 and not enough on channel 2 for the packs we were charging (2S 5000 mah Lipo’s that we like to charge at between 2-3C). The design of the VR-1 has a large footprint, and while that wasn’t really an issue with us because we keep such well organized pit tables (LOL) a smaller footprint would leave more room for wrenching. We ended up using the VR-1 on a vertical charge stand with the power supply under our pit table. The power supply mounted down below knocked down noise levels while using the VR-1 on the more vertical charger stand saved space. Time To Bash: C The VR-1’s fast charge function and high amperage charge rates make it one of the fastest chargers on the market. However, the VR-1’s menu, knob and buttons can take a while to master. Car Show Rating: A Everyone was feeling the love for the murdered-out/custom wrapped look of the TrakPower. Bash-A-Bility: A We put the VR-1 through the wringer and it walked away with no issues. Power: B 20 amps on channel 1 plus an additional 6 amps on channel 2 is a lot of power for most users. 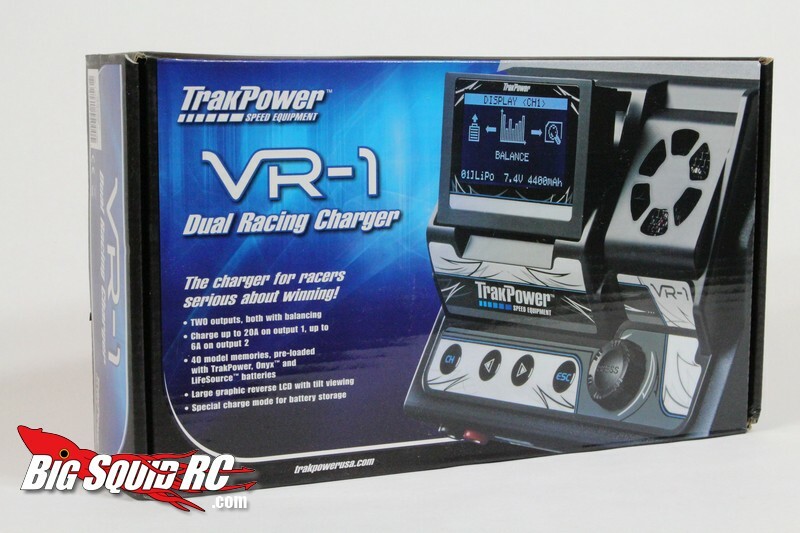 Value: B There are other premium chargers on the market at right around the same price point that do not have the power or produce the same quality of charge as the TrakPower, thus making the VR-1 a good value in our eyes. 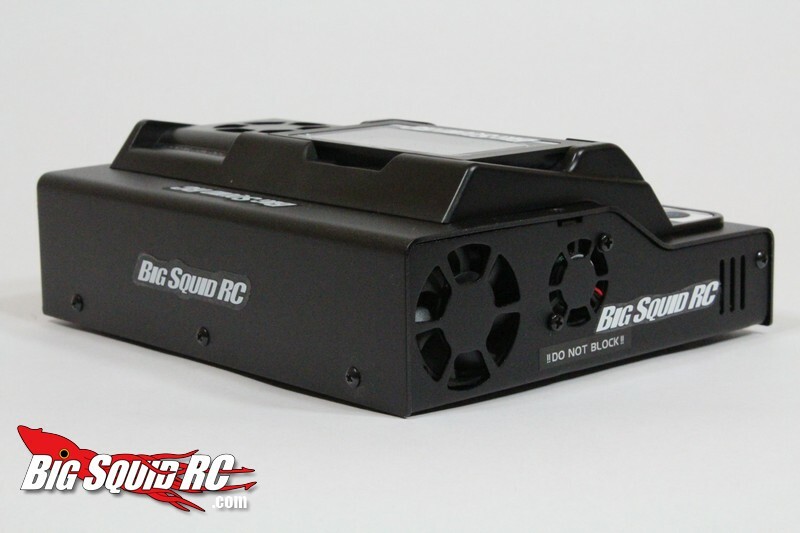 BigSquid Rating: B+ The VR-1 is a solid piece of equipment. Looking to save some time? The VR-1’s fast charge is one of the quickest on the market. Looking for an extremely high quality charge? 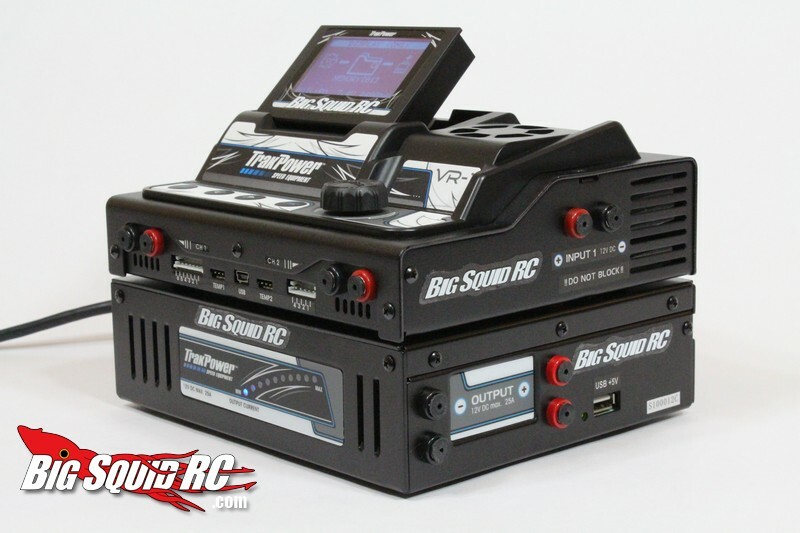 Put the VR-1 in balance charge mode and hit the track with more voltage and run-time than the other guys. The VR-1 looks great and charges even better, we highly recommend it.